A look at the best board games and card games published in 1985. Here are the board games and card games that I believe are the best which were published in 1985. Try finding one and playing. Designed by Klaus Teuber, published by Asmodée Editions. Inkognito is a great deduction game, played in teams. Every player is a spy, and your first job is to figure out which of the other players is your partner. Wandering the streets of Venice during a carnival, with everyone wearing masks, makes that task quite challenging. After finding your partner, you must complete your mission. For 2 to 4 players, ages 10 and up. Designed by Klaus Teuber, published by Queen Games. In this excellent family strategy game, players are artisans who work to restore the fresco in a Renaissance church. With the help of five workers, players plan each day by choosing from such tasks as buying paints in the market, mixing paints to create additional colors, restoring part of the fresco, and painting portraits. The first decision you make each day is when to start work -- an earlier time has benefits but also causes workers to be less productive due to lack of sleep. Fresco is a beautiful, engaging board game. For 2 to 6 players, ages 12 and up. Designed by Philip Orbanes, published by Matt Worden Games. Players take on the role of space captains in Jump Gate, competing to acquire the most valuable resources from various planets. On each turn, a player can take two actions such as scanning a planet (revealing a resource), claiming a planet (revealing all resources and taking one), and jumping to another planet. At game's end, scoring takes place and it varies by resource. For example, gem scores are based on how many a player has multiplied by the size of that player's largest color group; "famous finds" are simply worth five points each. Players also score for many of the actions they took during the game. For 2 to 4 players, ages 8 and up. 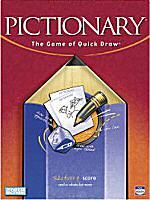 Designed by Richard Garfield, published by Hasbro. In this cooperative game from the designer of Pandemic, players work together to save four treasures from a sinking island. The 24 tiles of the island are laid out randomly, and each player is given a role (diver, engineer, explorer, messenger, navigator, or pilot) with a unique power. As the game progresses, players collect cards to claim the treasures while the island sinks around them. When the treasures are in hand, our heroes must race to meet the helicopter and fly away before the island is gone. There are four difficulty levels, and many times the outcome of a game comes down to the last possible moment. Forbidden Island is the best family game I've played in many years. Other winners of the Mensa Select 2010 award include Anomia (Andrew Innes, Anomia Press), Dizios (designer not credited, MindWare), Word on the Street (Jack Degnan, Out of the Box Publishing), and Yikerz! (designer not credited, Wiggles 3D). The goal of Magic: the Gathering (often referred to as Magic, M:tG or MtG) is to win a duel against your opponent, reducing his life points to zero. Thousands of Magic cards have been published, and players use them to build customized decks for each game. A professional Magic: the Gathering tour brings together some of the world's best players. Scattergories is a tremendous party game, not entirely unrelated to the public domain game known as Categories.